"I pride myself on being dedicated to the Military and serving others." Growing up in Grand Rapids, Mich., Steven Tener was always looking for a challenge. He pushed himself throughout high school playing football, and when it came to enlisting in the Military, his attitude was no different. Steven visited with a Marine Corps recruiter and, two weeks later, was on a plane to San Diego, Calif., for boot camp. During the 12-week training process, he was selected to be a squad leader and put in a position of leadership right away. 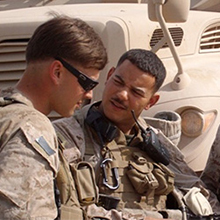 Steven had selected a career in infantry, so upon graduating from boot camp, he headed to Camp Pendleton for two months to attend the School of Infantry. From there, he was stationed in Hawaii for three years and then Michigan. During that time, he also took part in several deployments. Some of Steven’s other deployments include traveling to Korea, where he earned a Korean Defense Medal; to the Philippines, where he helped provide security from terrorists; and to Iraq, where he served as a combat replacement in the re-attack on Fallujah — otherwise known as Operation Phantom Fury. But Steven’s experiences with the Military weren’t always about combat. Today, Steven is serving as a company convoy commander in Afghanistan. In charge of a mobile unit that maneuvers throughout areas of operation, he juggles a variety of responsibilities: clearing roads to make sure they’re safe for local and military travel, moving equipment or personnel from one location to another, escorting emergency ordinance operations and monitoring enemy movement. He is in charge of four Mine Resistant Ambush Protected vehicles, approximately 15 Marines and four heavy machine guns. Though Steven and his men are armed for combat, they haven’t seen much thus far but feel prepared for it if and when they do. Steven also credits his experience in feeling prepared. He’s coming up on his ninth year serving in the Marine Corps. He hopes to get promoted to staff sergeant this year so he can try his hand at leading a platoon, but regardless, he plans on making the Military a career. At 29 years old, after already traveling the globe, leading men in combat and mentoring underprivileged children, Steven Tener is certainly wise beyond his years. And luckily for the Marine Corps and citizens he currently protects, Steven is just getting started.